Since it is already the middle of february, I am thinking it’s about time we actually start working on that project list I posted a month ago. I decided to start off easy and tackle the one project that needed the least amount of work. I know, right? I hardly ever make yearly project plans – for obvious reasons – so the thought of being able to cross something completely off the list this early in the game is a step in the right direction. 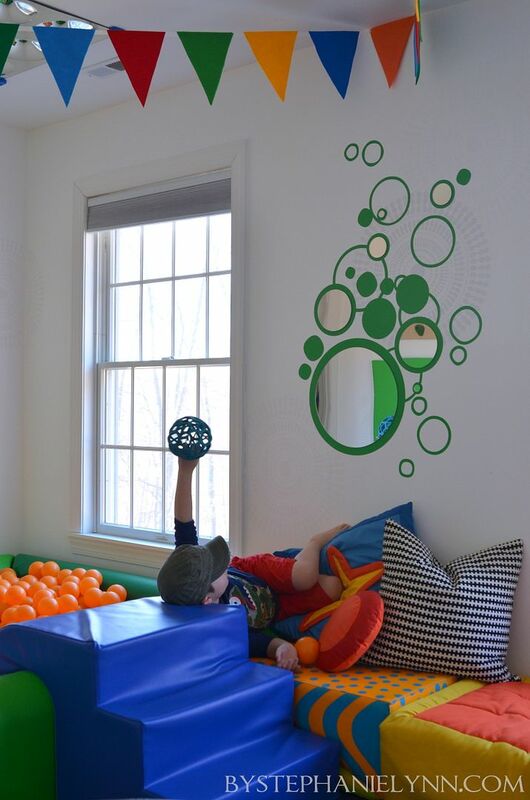 Shortly after we moved in we converted one of the extra bedrooms in the house into an indoor sensory playroom for CJ. 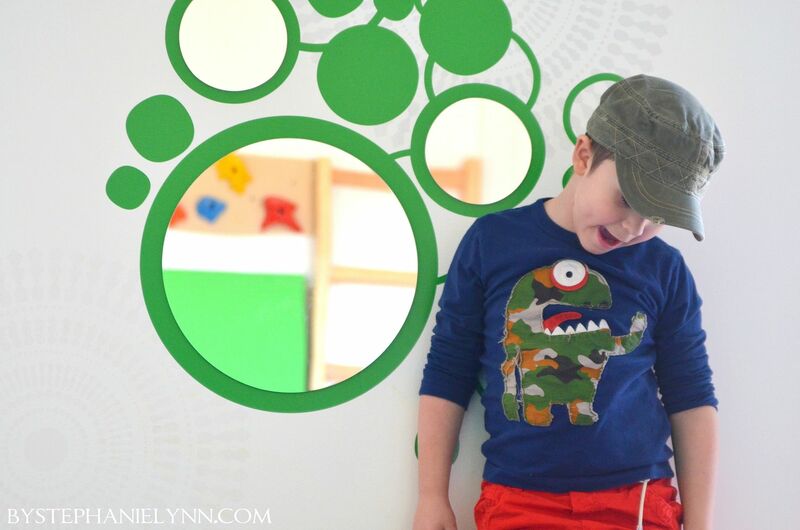 Despite the fact that the room has been 75% done for quite some time – it has been one of the most used rooms in the house and very beneficial for our little guys needs. I’ll be sharing more about why we choose the equipment that we did and the sources a little later – as today I want to share some new wall art we just added to the space. When we first decided to covert the room, the walls received a coat of bright white paint and a little white on white stenciled wall design. Once the main furniture and equipment were in place I decided the walls needed some color and added the fabulous, colorful artwork from Ron Burns – shown above. While I absolutely adore the puppy dogs, I quickly came to the realization they probably were not the best choices to hang on a wall in an active playroom… especially when the balls start flying through the air. So when the folks from Dezign with a Z Wall Decals reached out a couple of weeks ago a little light bulb went off. 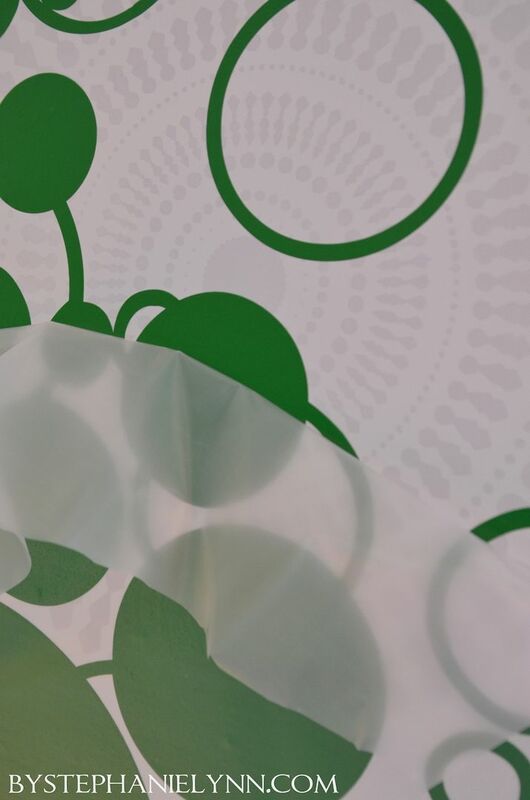 From 3D appliques to acrylic wall mirrors – they offer a lot more than your average wall decal store….more like wall stickers on steroids. 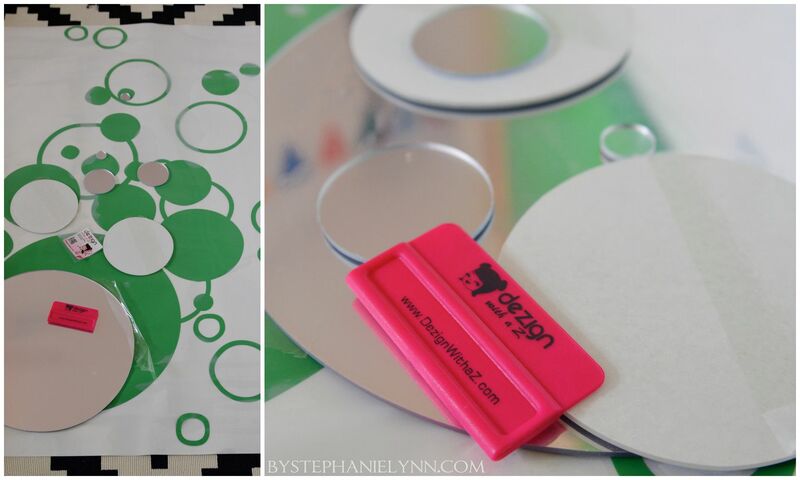 I loved the idea of combining colorful vinyl with safe acrylic mirrors and thought the bubble clouds design would be the perfect option to fill the wall space in the playroom. 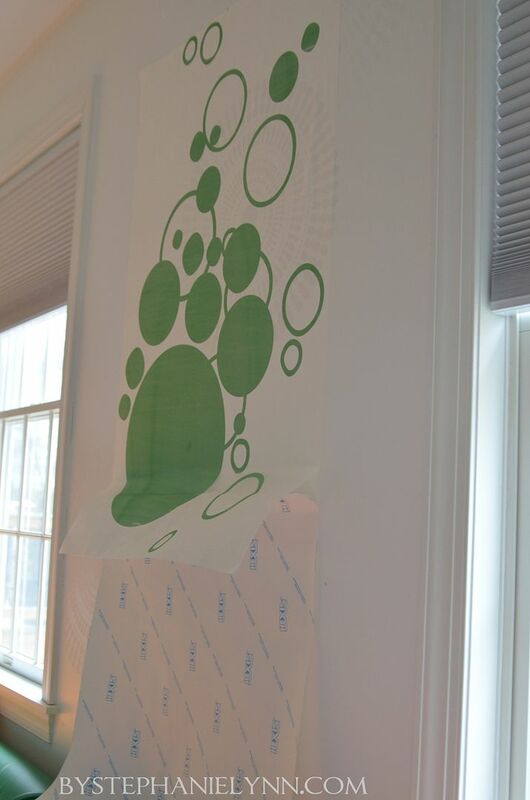 First off, this decal is big – like 47″ by 30″ big. Seems a bit intimidating but it was a breeze to apply. Butch just helped me align the top then I was able to apply the rest myself. Once the vinyl was up the acrylic mirrors just need to be placed on top. 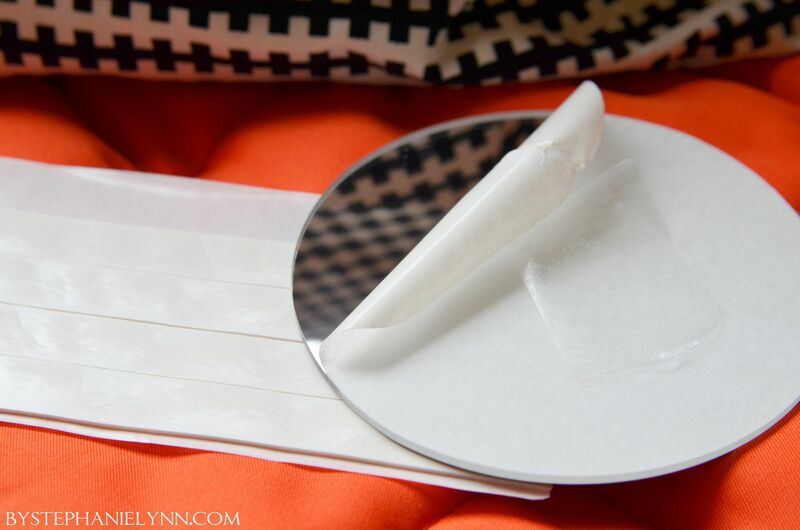 They sent along some heavy duty double sided tape which we decided to use. 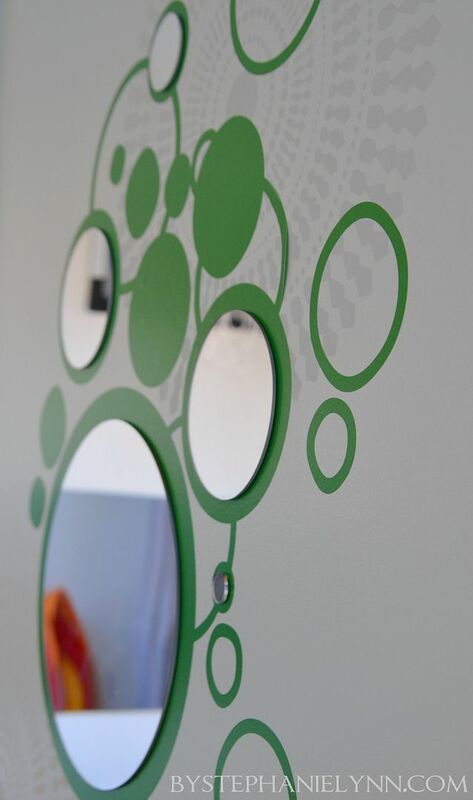 I have a couple of acrylic mirrors in the room already and can tell you they are awesome. I love that they are heavy duty and durable, yet so lightweight. 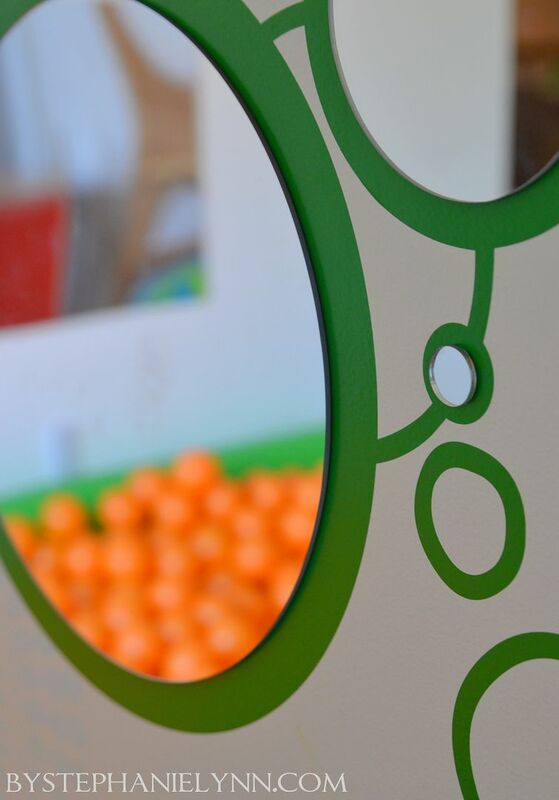 Where glass mirrors can be hazardous if impacted in such a space – these are safe and kid friendly – and they give off the same reflection. 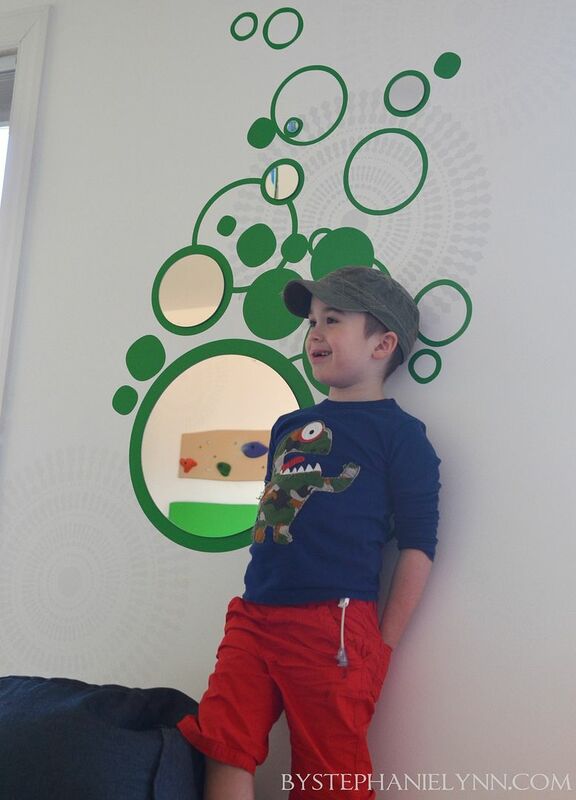 CJ loves them too – they help with his sensory integration and provide some much needed visual stimulation. You can catch a glimpse of the subtle white on white wall stenciling above… the stenciling was done with regular acrylic paints. though I’m still searching for some window treatments to go over those needed black- out window shades. 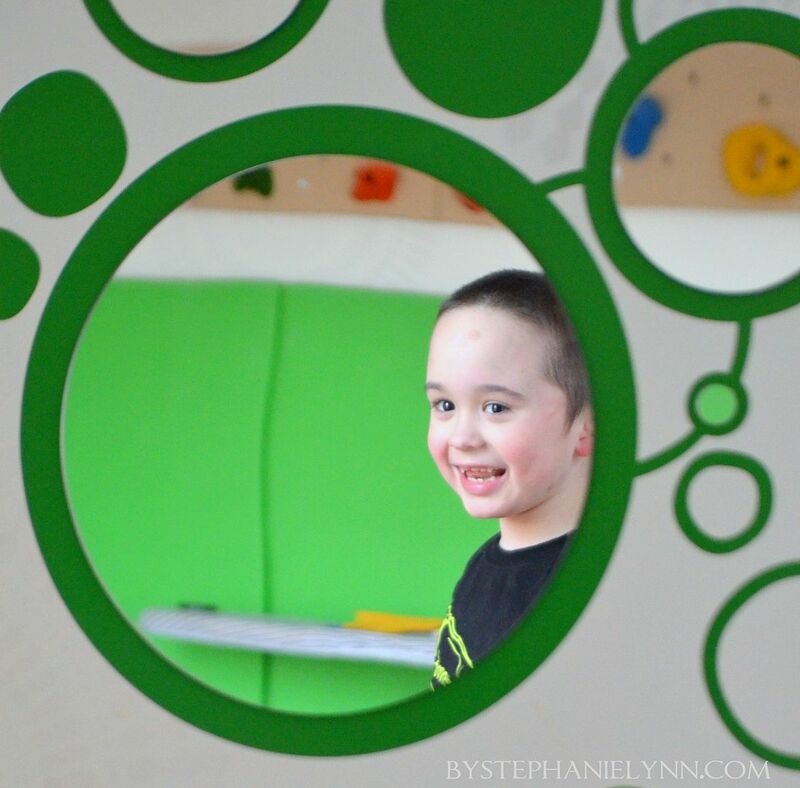 I always adore your posts on the sensory room. I think it’s awesome he has that area in his own house where he can use it as much as he wants rather than only being able to use it at school. Love that room! Your son has grown so much. I can tell that he has the PERFECT and BEST parents that are possible for him. What a very blessed boy! 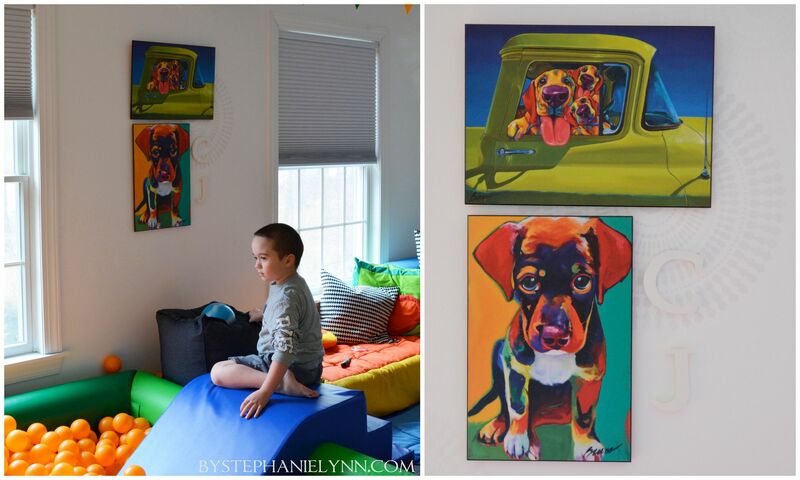 Your playroom is amazing, any child would love to have one just like it. Both the decals and the artwork adds such cheerfulness. We absolutely adore the review! It gives a whole new dimension to the product. And all the girls here at Dezign With a Z are in love with your little fellow! Thank you again for accepting the challenge of reviewing our product and it has been an absolute pleasure working with you! 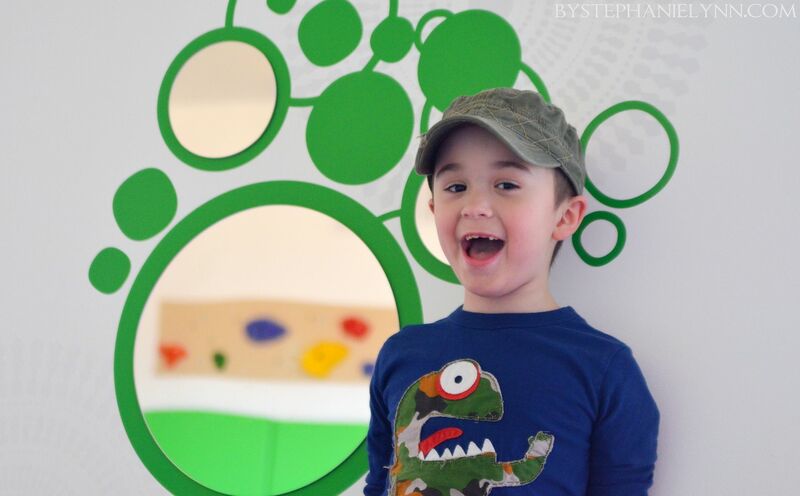 This room brings new meaning to the term “sensory regulation”! Love it.